Single vintage and single estate Tequila Ocho Puerta Del Aire 2016 Reposado is produced at the famous La Altena Distillery- NOM 1474 in the Los Altos region of Jalisco. This light Reposado is a delicious well made tequila, made by the team of Carlos Camarena and Tomas Estes in Arandas, Jalisco. (SEE PICTURES BELOW). Tequila Ocho is a unique tequila, created by Tomas Estes, one of the most influential people in the Tequila industry, and Carlos Camarena, who needs no introduction, other than to say he is the 3rd generation Master Distiller, and his family has 5 generations of experience growing quality agave, making some of the world's finest tequilas. 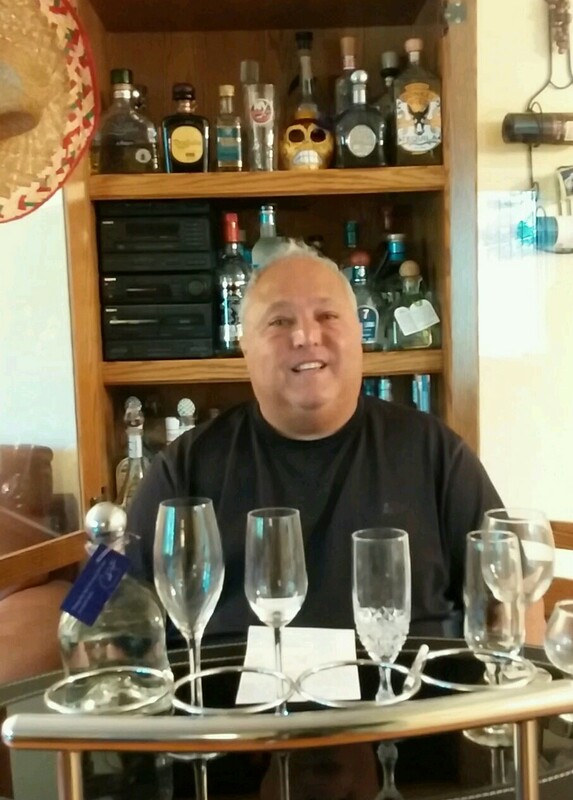 Estes is one of only two Tequila Ambassadors for the Mexican Government worldwide, and being a wine connoisseur, he wanted to showcase tequila in a similar way. They highlight different ranches and fields in different areas, from Carlos Camarena and his family's agave fields. These different fields offer different tastes, due to the terroir and the single estate agaves, just like wine does. Tequila Ocho (8) is named for the fact that both Carlos and Tomas tasted all the samples separately, and blind, and they both had each selected sample #8 as having the biggest agave flavor, and thereby best showcased terroir. This #8 sample became the basic formula for Tequila Ocho. Let's not forget to mention that the Camarena's have been making Tequila for 8 decades, and SURPRISE...... this Reposado is aged for 8 weeks and 8 days. That's a lot of reasons to call it Ocho. Tequila Ocho has always been unique for coming out with different presentations, highlighting different tastes and profiles. Each years presentation is different, and their blanco is one of my absolute favorites. The Camarena family agaves come from single estates at different altitudes and unique micro-climates, giving each vintage a unique flavor and aroma, imparted from the character of this soil and the environmental conditions within each estate . The vintages are named for the estates the agaves were harvested from, along with the year it was produced. Each estate, or 'rancho' produces a limited amount of agave, and many people collect the different vintages of Ocho, as they become rare and collectible. Camarena and Tequila Ocho, were the 2017 'Sustainability Spirit Award Winners', by Tales of The Cocktail, and Tequila Ocho is the 2017 and 2018 'Top Trending Tequila' by Drinks International Brands Report. These agaves are grown with oak and cedar trees inside, as well as on the sides of this field (Puerta Del Aire), at 2,095 to 2,118 meters above sea level on a gentle slope of red soil. Brandon Cummins- (SEE BELOW- on the left), who works with Ocho on behalf of Altamar Brands here in the US (importer), told me that "pertaining to this field, Puerta Del Aire, was the first Camarena field designated as a 'Bat Friendly' field, with a small percentage set aside for bat pollination of the quiotes (stalks), thereby rendered unusable for Tequila production." For more information on the Bat Friendly program SEE-http://www.tequilainterchangeproject.org/2016/11/17/batfriendlyspirits/ . Some bottles are given this new sticker for bat friendly (120 stickers for each agave donated, representing the approximately 120 bats that on average, feed on the single plant). So even though the bottle may have the sticker, at this point.... it wasn't technically pollinated by the bats. I have tried other short aged Reposados, one of which has recently gotten a lot of attention. This Ocho Reposado is only rested for 8 weeks and 8 days, and for about the exact same resting as this other brand, has a more 'finished' feel. Although Tequila Ocho is also very light in color- (SEE BELOW), it's more complete and mature for a shortly rested Reposado. Tequila Ocho is purposely going for this profile, to showcase it's different terroirs and as such, I can see how it can be light in flavors for some. I noticed that it is easier to drink with less alcohol presence than some of the other shortly rested brands. Also remember that Ocho has always used older, very worn 'ultra neutral' barrels, which are usually seventh or eighth fill. These are typically 200 liter American Oak whiskey barrels, and in some cases 25-30 yrs old, so as not to add a lot of oak and color, but to keep the agave flavor forward, to feature that years offering. Brandon also told me "remember, for Ocho it is about setting a standard to the 'minimum', as it's all about terroir, and not oak." I like that myself, and have no issue with that, as I do not like an over oaked product. A matter of fact, the color and flavor is so light 'because' of the worn neutral barrels, that Ocho needs the other Reposado barrels to mix together. When I asked him why there is no single barrel reposado, Cummins said "we need a full set to develop enough flavor to create depth because of the neutral oak". I assume because a particular barrel could be too light overall or 'different' in some other way, that blending them 'naturally', and adding nothing else, is necessary to make this Reposado. It has a delicious taste, with a definite minty, green, sweet and spicy, mineral profile, but it's balanced and matured, and there's no mistaking.... it's a Reposado. Being a 'Lou's Top Tequila' please see Tequila Ocho's logo on the side of this page, click and visit Tequila Ocho's website. PRODUCTION- double distilled, and bottled at 40% ABV, for about $47 or more a bottle, this Reposado is light and tasty. The agaves are 7 years old with a 26 percent sugar content, grown on a slope of red soil from the single estate of Puerta Del Aire. The Los Altos agaves are cooked in traditional stone brick ovens for 48 hours then rests and cools for 24 additional hours. Carlos calls this resting period..."Feng Shui-ing" the Tequila. It is then milled with a shredder/roller, followed by fermentation in open air small pine wooden vats, using natural yeast. Two distillations occur, the first in copper lined stainless steel pot stills, and the second in smaller copper pot stills. At this point the abv can be 48-55%, and after open air resting in stainless steel tanks, it is 'proofed down' with the iron rich water. Check out the picture (BELOW) of the iron/mineral rich water leaving deposits on the La Altena wall, from the natural deep stream under the distillery. Tequila Ocho also makes a point that it is not chill filtered, which in the end.... gives it more flavors. NOSE- sweet cooked agave, light floral, mint, spice, light caramel, light vanilla, light fruit, lime citrus, light smoke, minerals, tea, grassy and green with very light oak and whiskey presence. A pinch of pine, and olive brine. TASTE- medium oils, a touch of cinnamon, a green slightly tart and herbaceous mouthfeel, with definite mint, some heat, agave sweetness, a little anise, light caramel, menthol or eucalyptus presence, lime/orange citrus, minerals and light spice. This 2016 single estate Reposado is very light all around, but has a complicated and exciting nose. Take the time to find all the aromas. There isn't a strong flavor profile, and it has very little wood presence, which is the point of showcasing the terroir and not the oak. For those looking for a traditional Reposado, this may be on the lighter side, but it's easy and enjoyable to sip, and no doubt a tasty, clean, well made Reposado.